1910 In, Heleni Giokarini established the first-ouzo distillery in Samos, producing ouzo which was known as the «WIDOW'S OUZO». GIOKARINI is still OUZO being produced with the same traditional passing for three generations. Experience of a The century combined with the careful selection of Pure ingredients which boil-In traditional copper distillation of pots, result-In the superb quality of OUZO GIOKARINI. OUZO GIOKARINI is the Today considered not Greece but an international level as unique for its superb taste and essence by those who have tried and enjoyed it unders the wonderful sky of Samos. 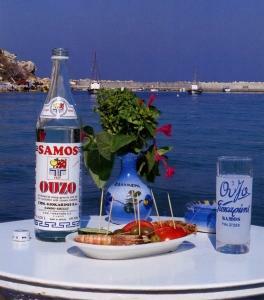 "Samos Ouzo: A light and pleasant ouzo that is produced by the Giokarinis family for over a century."